RE.F8-N Monolithic wheels has a steel sheet bracket and a wheel center body that is made of polyamide based technopolymer that can resist solvents like oils greases and other chemical agents. It features an axle set that has a calibrated precision tube that serves as a spacer connected to the bracket with a screw and a nut to a not yet determined torque value. 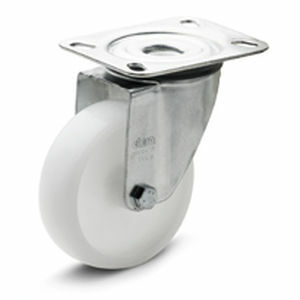 The wheel is made up of either zinc plated steel bracket with a turning plate and brake or can also be a brake less wheel with zinc plated steel and fixed plate also with a dust seal technopolymer.